Experiencing the aging process helps one understand what creates the need for change in exercise patterns. Here are a few things I have observed in myself and general populations during my 20 years as a trainer and teacher. 20s - Most 20-yearolds need to be challenged all the time. This makes perfect same as we are full of energy, have relatively few commitments and responsibilities, and are seeking a mate and therefore want to look good. If exercise isn’t hard enough to make you want to throw up or make you look good, how good could it be? 30s - Physically there may be no decline, but more serious relationships develop and careers are more important. With these new responsibilities come extra stress, less free time, and some attitude shifts. We may be less inclined to do a particular form of exercise simply for cosmetics and may opt for exercise that is also enjoyable and helps reduce stress as well. We begin to see the benefits or need for change, and for some, a firm behind may not be enough reward for time spent. 40s - This age can light a fire under some people and they tend to hit the gym pretty hard either to maintain or to slow down the decline. Small aches and pains start to kick in, and those who have already been working out hard or played sports daily may be experiencing more nagging pain due to repetitive use wear and tear. This is an interesting age because the will and need are still there, but continuing to do the same things can cause more serious, longterm damage. In addition, free time is rare. We demand more from exercise – cardio, muscle mass, flexibility, stress relief – and due to lack of time we need it all NOW. Exercise is done either first thing before work, right between dropping off the kids and before the next meeting, or during the weekends. 40’s are short on time, high on stress, and exercise becomes even more important for these reasons. 50s – People in their 50s tend to be better on time and stress levels. Around this time past behavior generally shows up in the knees, back, shoulders, heart etc. Doing Yoga or Pilates while still young and feeling good is a great preventative measure. Picking either one up later in life is often because of need. 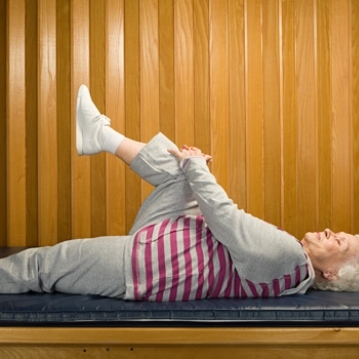 60s and above - Exercise becomes more important than ever because once you stop moving, your body will follow suit. 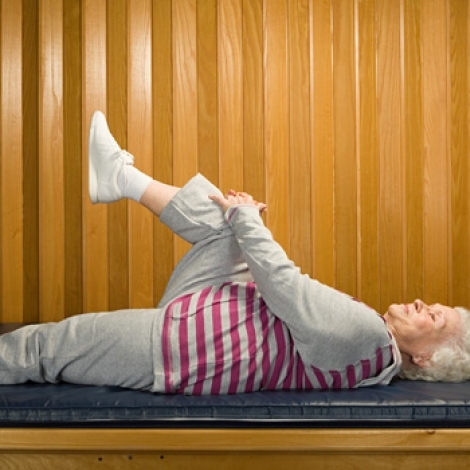 All forms of exercise are equally important, but more care must be taken to prevent injury. We need cardio to keep the heart happy, muscles for strength, flexibility for easy movement… but if we injure ourselves, then we defeat the purpose of exercise. Paying attention to movement becomes more important. These are just a few observations made across two decades of being a trainer or teacher of everything from weight training to martial arts boot camps to Yoga. Here are a few more. I have seen 80-plus-year-olds in arm balances I still can’t do, 60-year-olds in full sprints during full marathons while I huffed and puffed through a half, men well in their golden years in solid and strong bodies, and 60-yearold women whose unbelievably strong and beautiful bodies continued to inspire the aforementioned 20-year-olds. If I had to sum it all up, it would be this: For long-term benefits and general physical well-being with maximum benefits and minimum wear and tear, mix it up. Do it all. Incorporate cardiovascular exercise with weight/resistance training, with flexibility and core training. This approach will not win medals for “best” or “most” anything but will keep the body at its best for longest. These, of course, are simply my observation-based generalizations.